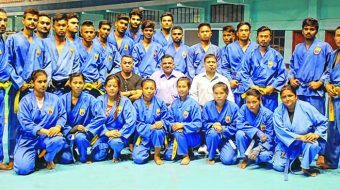 Dr Sahai made the statement while on an inspection visit during the ongoing Vovinam National Camp here in the run-up to the 5th World Vovinam Championship, which is going to be held in New Delhi next month . He said that the game is played across 21 states in the country and that it has been accredited by the School Games Federation of India. He also mentioned that the game is already a major event of the National School Games . Across India, Dr Sahai singled out it is most popular in the states of, amongst other, Manipur, Maharashtra, Uttar Pradesh, Karnataka, Bihar, Rajasthan and Assam. He added India had also performed exceptionally well in the game in this year’s BRICS Games . Dr Sahai disclosed that the formalities are in process at the ministry level to grant due credentials to this game. He further said that Manipur has been selected for the ongoing National camp considering the favourable conditions of the state including its conducive climate and popularity of the game. He also expressed his optimism that the nation would continue to excel in the forthcoming World Championship in August. Out of the 24 vovinam players in the ongoing National Camp, 15 are from Manipur.